For all the big ideas, big networks, and big data to come from the Internet of Things (IoT), its foundation rests on the smallest of devices. Micro-electromechanical Systems (MEMS) sensors will be at the frontline of data gathering and analysis in the IoT, and while it’s evident there won’t be a problem finding data to collect, the challenge will be in blending data from multiple sources to improve efficiency and enable new applications. One answer, MEMS sensor fusion. Efforts to improve MEMS sensor fusion are occurring on many fronts, with the development of standardized MEMS sensing frameworks and the use of hardware/software co-design being two examples. Mike Stanley, Systems Engineer at Freescale Semiconductor in Tempe, AZ (www.freescale.com) believes that “hardware/software co-design will be done at the lowest level of the IoT – the embedded sensor board,” as the “tools exist and are relatively straightforward to use.” However, he also notes that although nearly any algorithm can be implemented in gates using C-to-RTL synthesis tools, this typically results in a power/performance/cost tradeoff, as well as an increased risk of changing algorithms once they have been reduced to the gates level (Figure 1). 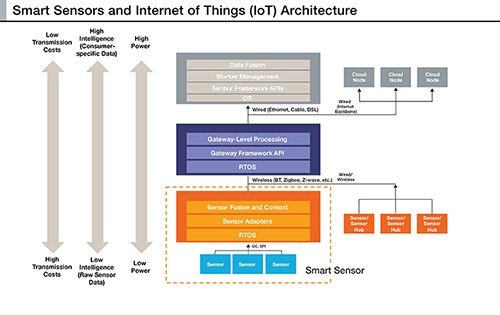 MEMS sensor fusion development often results in tradeoffs between cost, performance, and power that Internet of Things (IoT) silicon developers hope to reduce. These and other semiconductor-level challenges in the IoT are being addressed at the SEMI Arizona Breakfast Forum on April 17th at Intel’s Ocotillo Campus in Chandler, AZ. In addition to the relationship between MEMS sensor fusion and the IoT, the program will examine the impact of IoT rollouts on the entire electronics value chain, examining how business models are adapting to changing market dynamics along the way. Interested parties can register online at www.semi.org/en/node/48626.